There is no celebration without great food! As we learned yesterday, Chanukah has it's own unique foods with great meaning! 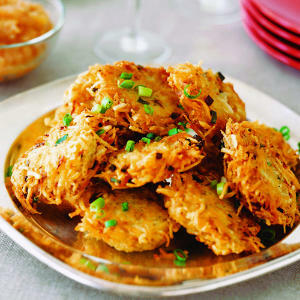 'The 2 Spies' favorite... LATKES! Potato latkes! For the uninitiated, potato latkes are basically a potato pancake. However, using the word 'pancake' seems just so wrong! These lovely, crispy fried treats are served with applesauce, sour cream or eaten just as they are. ( My mouth is watering!) There are many versions of latkes but potato is the most traditional. At the end of this article we'll give a simple recipe. Over the years, makeing latkes has become quite a science. To get the latkes just right~ crispy on the outside, moist on the inside~ without being soggy~ we are going to share some tips we found to hopefully guarantee the PERFECT POTATO LATKE! Enjoy! The best latkes are golden and crunchy on the outside, soft and tender on the inside. Latkes are traditionally eaten at Hanukkah, but they're a treat anytime you crave crispy, savory potato pancakes. For best results, use russet potatoes. They are high in starch, which is necessary to form pancakes that don't fall apart. If you peel the potatoes before making latkes, put them in water between peeling and shredding to prevent oxidizing and discoloring. Have the onions and any other veggies trimmed and peeled, have a piece of cheesecloth ready and waiting, and measure out the other ingredients your recipe calls for: matzo meal or flour, baking powder, eggs, cheese and seasonings. If you have a food processor with a shredder attachment, this will make the process go faster, but a good old-fashioned hand-held grater will perform the job just fine. Alternate the potato with the onion and other vegetables while you shred in order to keep the potatoes from oxidizing too quickly. If you want lacy latkes with rough, crispy edges, shred those potatoes coarsely. If you prefer denser latkes with smooth edges, use the fine side of the grater. The potatoes need to be dry and the oil needs to be good and hot so that the exterior of the latke will get crispy and prevent the pancake from absorbing too much grease. When you cannot get any more liquid out, open up the cheesecloth, stir the mixture around a little, and then squeeze it some more. Empty the contents of the cheesecloth into a mixing bowl and mix in the remaining ingredients. Heat a heavy-duty pan with vegetable oil ¼- to ½-inch deep. When the oil has reached a temperature of about 350 degrees F (175 degrees C), it's time to fry! If you don't have a deep-fat thermometer, you can test the temperature of the oil by dropping a small amount of latke mixture into the pan. If it turns golden brown within one minute, the oil is ready. Form the latkes by carefully placing spoonfuls of the mixture into the hot oil, then flattening the mounds with a spatula. Fry until nicely browned on the bottom, then flip the latkes with a spatula and brown the other side. Drain the latkes on paper towels and serve them immediately, if possible. If you aren't able to serve them right away, keep them in the oven at 200 degrees F (95 degrees C) on a cooling rack placed over a cookie sheet. To keep them nice and crispy, don't stack them or cover them. 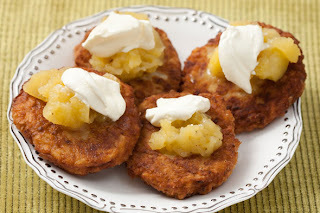 Serve hot latkes with applesauce and sour cream. The oil is probably not hot enough. Allow it to come back up to temperature between batches of latkes. Did you squeeze out excess moisture from the shredded potato mixture? Extra eggs, matzo meal, and shredded cheese will all help bind the mixture together if it seems too "loose." Keep peeled potatoes immersed in a bowl of cool water until the second you're ready to shred them. To remedy this problem, you can shred the potatoes more finely, make sure the oil is hot enough, make the latkes thinner, or pre-cook the potatoes. Again, pay attention to the type of potato and the temperature of the oil. These are the two most important factors in achieving latke perfection--and for best results, latkes should be served hot from the pan to the plate. Today is the day Hanukkah will begin...no doubt much happy anticipation among Jewish people worldwide! Tho' being Catholic I feel & share their joy! Glad I researched & found good info re many good things - e.g. Latkes! Yum! Will make & enjoy very soon! HAPPY HANUKKAH! (Or should I say CHANUKAH?!) :D ENJOY!